If you are planning to study in Canada, be very sure to read this first. If you are planning to Study in Canada with the end in view of applying for permanent residence, you need to be very careful. Studying in Canada is not a guarantee that you will be get a permanent resident status. 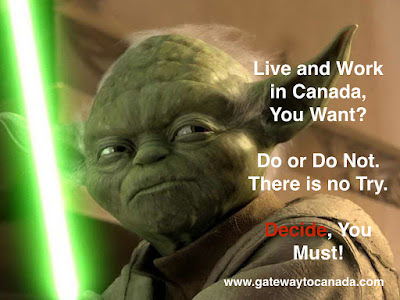 Read more from Gateway to Canada. Do you really want to live and work in Canada? You need to decide. Do or Do Not. There is No Try. For more information, read Morden Immigration. Canada's Express Entry System is Now Open! If you are one of those planning to immigrate to Canada, you may be interested to know that Express Entry System is now open. The Government of Canada believes it will be a better management system that will dramatically address the immigration problems and that it will be beneficial both to Employers and Prospective Immigrants. Proactive Immigration Advisers will be conducting series of information seminars about this. If you are interested, check their seminar schedules. 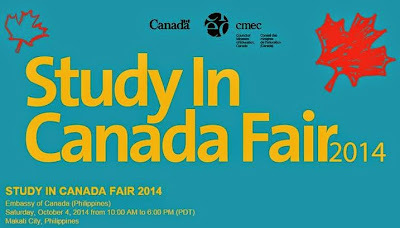 I was browsing the net when I came across article that led me to know about the upcoming Study in Canada Fair 2014. For those of you interested in studying in Canada, here's an event that can be the key in achieving your dream in studying, and ultimately, work & live in Canada. The fair will be held on October 4, 2014 at the Fairmont Hotel in Makati City from 10 am to 6 pm. Admission is free and you can register online. Just go to www.studyincanada.eventbrite.com. The best part is that it is endorsed through the official Facebook page of the Embassy of Canada in the Philippines.